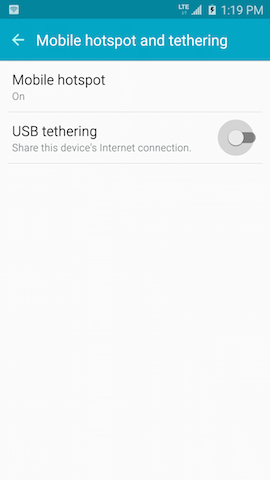 How do I set up the Mobile Hotspot or tethering on my Galaxy S6 Edge? 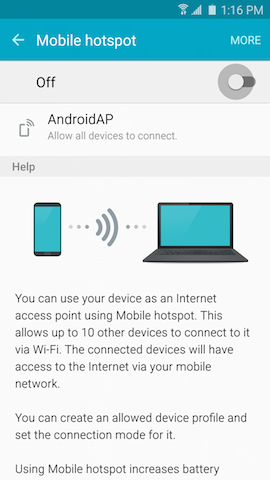 The Mobile HotSpot feature lets you share your mobile device's data connection with other devices by turning your device into a wireless access point. You can connect up to eight wireless devices via Wi-Fi. Important: Using your mobile device as a wireless access point or wireless modem is data-intensive and will dramatically reduce battery life. We recommend contacting your wireless service provider to ask about availability with your plan. 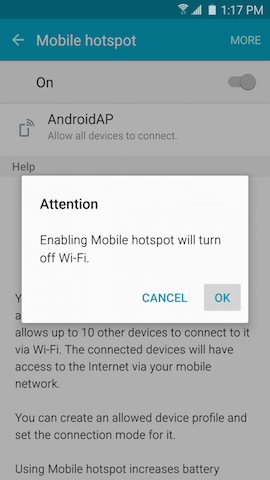 We also recommend keeping your device plugged in while the hotspot feature is on. Note: The provided information refers to the devices sold in Canada. 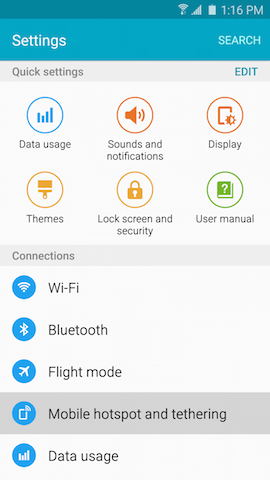 Screens and settings available may vary depending on your Canadian wireless service provider and your software version (Android 5.0 Lollipop was used for this FAQ). 3 Touch Mobile hotspot and tethering. 5 Touch the slider to turn Mobile hotspot on. 6 If you are connected to a wireless access point, you will be disconnected before you can turn on the hotspot. Touch OK to continue. The Mobile HotSpot icon displays at the top of your screen when Mobile HotSpot is turned on. 5 Touch MORE > Configure Mobile hotspot. 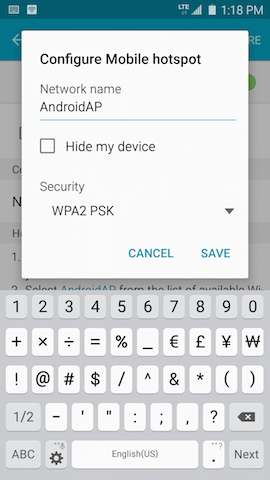 6 Enter or edit the Network name, set your Broadcast network name (SSID) preference, select the Security type, and enter or edit the Password. 7 Mark the Show advanced options checkbox to configure the Broadcast channel, Maximum connections, and Timeout settings. 8 Touch SAVE to continue. The hotspot will turn off and turn back on with the newly configured settings. 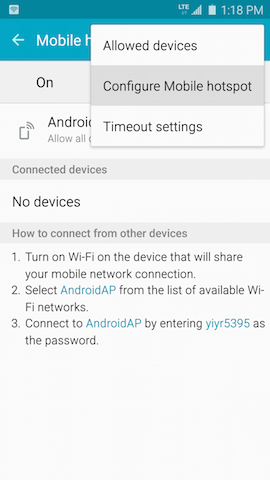 1 Turn on the Wi-Fi feature on the device you want to connect to your Mobile HotSpot. 2 Search for your hotspot using the information shown on the Mobile hotspot settings screen, and enter the necessary information. Your mobile device can be used as a wireless modem to share its mobile data connection with a single computer. 1 Connect your device to your computer using the supplied USB cable. 2 From the Home screen, touch Apps. 4 Touch Mobile hotspot and tethering. 5 Touch the USB tethering slider to turn the feature on. 6 If you are connected to a wireless access point, you will be disconnected before you can turn on tethering. Touch OK to continue. 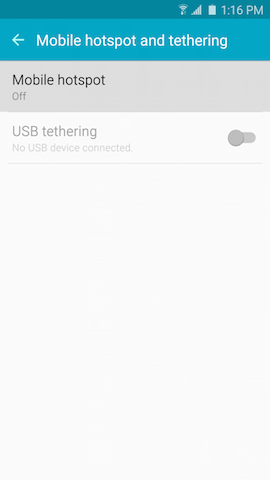 The USB tethering icon displays at the top of your screen when USB tethering is turned on.